Customers often ask how to access a live view of their remote security cameras when they’re away from their home or business. After all, people lead busy lives, come in and out of work, go on vacations, and run errands so investing in a remote video surveillance system is crucial to the well-being and safety of your home or business. Thus, much of the time you’re not actually able to be onsite where your cameras are installed. One of the primary benefits of IP video is that you’re not limited to viewing your remote video surveillance system on site. The advancements in video surveillance technology have made it possible to view your remote security camera from any internet-enabled PC or smartphone. 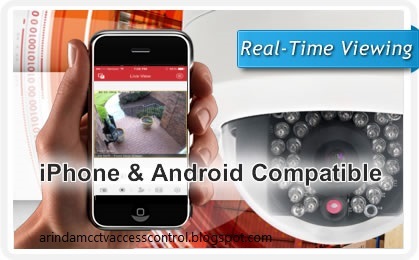 arindamcctvaccesscontrol.blogspot.com has outlined the key components of remote security camera system and video surveillance app, everything you need to know in order to start viewing your security cameras off-site. View Live Stream - Real-time video display is a primary selling point for remote and mobile monitoring. Having direct access to your live camera feed gives you the power to monitor your property without actually being there. View NVR Live Stream - Some NVR manufacturers offer remote web interfaces and video surveillance apps that provide remote access to your IP camera system. These Internet-based platforms give you instant access to live camera displays and recorded video footage that work on PCs, and some smartphones. You simply log on to the NVR’s web interface or app to facilitate real-time monitoring. View Recorded Video from your camera/NVR - Another benefit of remote monitoring and mobile surveillance is with some mobile apps and NVR web interfaces, you can view recorded video. This is especially helpful when you’re on vacation; you can review recorded video and decide if it’s relevant or not, or notify law enforcement if you come across something suspicious that was captured on video. Images are sent to your phone, on motion or schedule - You can configure your IP camera so that images are sent directly to your email account or smartphone via message MMS if motion, tampering, or vandalism is detected. Images can also be sent on a schedule to keep you abreast of what your video monitors. Send images to email account - With video management software, you can configure your security cameras to send email alerts to your smartphone, iphone or email account for evidentiary purposes and as a way to archive footage deemed important. Administer VS System remotely - You can do a lot more with mobile and remote monitoring than just viewing live video. A number of IP camera and NVR brands offer web interfaces and cloud services that can be accessed from remote locations. These online platforms allow you to control the settings and configure your IP camera system like you would onsite. DDNS - With video management software, you can configure your security cameras to send email alerts to your smartphone, iphone or email account for evidentiary purposes and as a way to archive footage deemed important. Port-Forwarding - When you purchase your IP camera system, you’re at first limited to viewing your cameras locally, meaning you can only access them in a local area network. To view your cameras remotely, you must configure port-forwarding. Port-forwarding sends network ports used by your IP camera(s) onto the World Wide Web so that you can monitor your cameras remotely. Network ports are typically forwarded through your network’s router, which tech support specialist at VideoSurveillance.com can help you with. Port-forwarding can only be set up by obtaining the IP address of your router that connects to your video surveillance cameras. It should be noted your IP cameras and NVRs are still secure when accessed via the Internet because of password protection. Special Plug-and-Play Solutions - Some NVR manufacturers such as Smartvue offer online cloud services that allow you to access your video surveillance system from a remote location by simply logging into your cloud account. Once logged in, you can view your live video feed, manage settings, and search recorded video as needed. 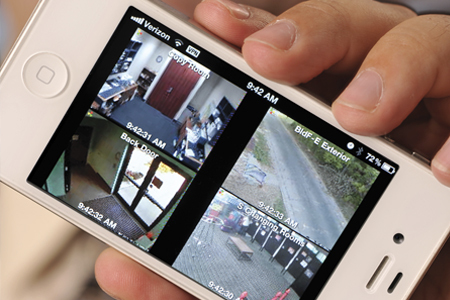 One of the more popular benefits of a modern surveillance system is the ability to monitor footage remotely with a mobile app. There's a wide array of apps that allow a user to log into your system from anywhere with just a touch of your smart phone. Upon logging in, you will have the ability to view live and recorded video, control PTZ settings, search through past footage and manage alerts. To set up the app properly, you'll need to work closely with a security company and have an internet data plan as well as an IP address. The best aspect of this feature is that you don’t have to be on location to view and manage your security cameras, thus offering you and/or your security staff the ability to monitor and respond to issues whenever they may occur, even after hours or while you are on vacation. The added peace of mind that comes with remote monitoring can be the greatest benefit of all. Also, you don’t have to be limited to monitoring only one security camera remotely. If your building requires multiple cameras in seperate locations, you're in luck as you can monitor multiple camera feeds from across multiple locations. This is a popular feature for property managers who need to monitor multiple buildings. This is incredibly useful when combined with a motion alert camera system-- you can be alerted if any of your cameras detect motion while your business is closed. In addition, you will get an email and/or text alert notifying you that one of your cameras detected motion. The overriding advantage associated with a remote monitored system is the fact that it provides visual confirmation to an operator regarding the cause of anyone specific activation. In turn, this lessens the likelihood of false alarms and allows the operator to orchestrate the fastest possible and most appropriate action. When an alarm is triggered, the process begins and the images are transmitted to a central control room where the operator consults site plans to determine whether to issue audio warnings or alert the relevant emergency services. Audio warnings have been proven to act as a successful deterrent for a majority of cases, in terms of contacting the emergency services, the visual confirmation provided by the operator allows them to give the activation a priority response and increases the likelihood of the culprit of any trespass or theft committed on the property in question. · Schedule notifications in case of an emergency. · Arm or disarm security systems remotely. Biometrics Market size is estimated to surpass USD 50 billion by 2024; according to a new research report by Global Market Insights, Inc. High acceptance among various verticals including mobile banking and financial services owing to rising security concerns has enhanced biometrics market size. Government initiatives for biometrics implementation coupled with high deployment for criminal identification will remain the key factors driving industry demand. India’s Home Ministry will ask for regulations or an amendment to the recently passed UIDAI Act to mandate that the Unique Identification Authority of India (UIDAI) share biometric data with the Registrar General of India (RGI). Sharing the data will ensure that RGI need not collect 18.5 million biometric identifiers for the National Population Register (NPR) which have already been collected for the Aadhaar scheme. While the NPR is used for the determine residency and establish the citizenship of each individual, Aadhaar is the civil ID program used by the Indian government to provide social services. To date, Aadhaar has issued over one billion Aadhaar numbers, with a goal of ultimately enrolling 1.28 billion people. Unnamed sources in the Home Ministry note that by using Aadhaar data, the RGI would not need to replicate biometric enrolment efforts or incur additional costs. Biometrics is an automated system of recognizing a person based on the person's physical or behavioral characteristics. It is the same system that the human brain uses to recognize and distinguish one person from another. It is a system that recognizes a person based on "who" the person is and does not rely on "what a person is carrying" or "what a person knows." Things that a person can carry, such as keys and ID-badges, can be lost, stolen, or duplicated. Things that a person knows, such as passwords and pin-numbers, can be forgotten, stolen, or duplicated. Instead, biometrics relies on "who" a person is and is based on a unique immutable human characteristic that cannot be lost, forgotten, stolen or duplicated. For these reasons, biometrics provides a much stronger level of security, while maintaining convenience and ease for users of biometrics. 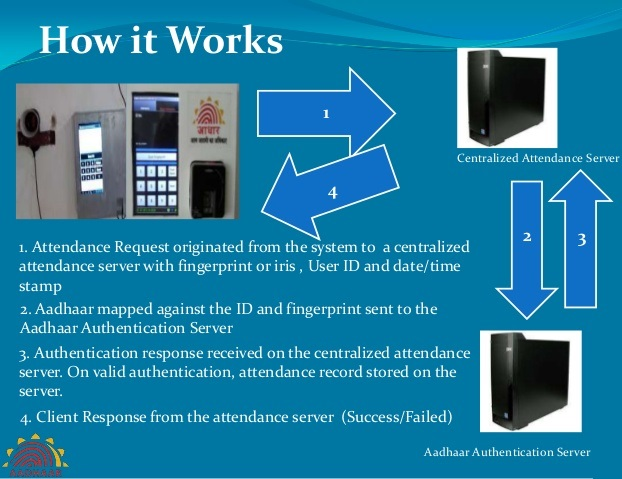 Aadhaar Enabled Biometric Attendance System is used to mark attendance using the Aadhaar Card number linked with Aadhaar server. Aadhaar based attendance machines can be used for student’s attendance. Options of Bio-metric Attendance Machines that can be used to mark attendance. Traditional panel-based access control systems use a central control panel or controller, card reader and controller at every door, card reader at every door controller in one place, which requires a significant investment in costly equipment and wiring, and makes the systems difficult to scale. IP-based access control solutions leverage the network, eliminating the need for costly central panels, and offering shorter wiring and cabling runs than traditional panel-based access control systems. We have absolutely seen an increase in biometric access control interest from hospitals, schools (day-cares), and universities. The uses range from just securing filing closets, accounting servers, and office to providing easy access to certain areas for certain employees, or parents. Physicians and technicians are given access to laboratories but restricted from hospitals filing areas. With door access devices students are not able to gain access to faculty areas without a proper card, pin code, or administered fingerprint. Here are some compelling reasons that will force you to consider installing an Aadhaar enabled Biometric Identification System if you haven’t already done so. Since the system combines the twin approval from the Aadhaar database as well as the organization’s database, chances of misuse are next to zero. Even if one system fails a second one is in place to ensure verity. 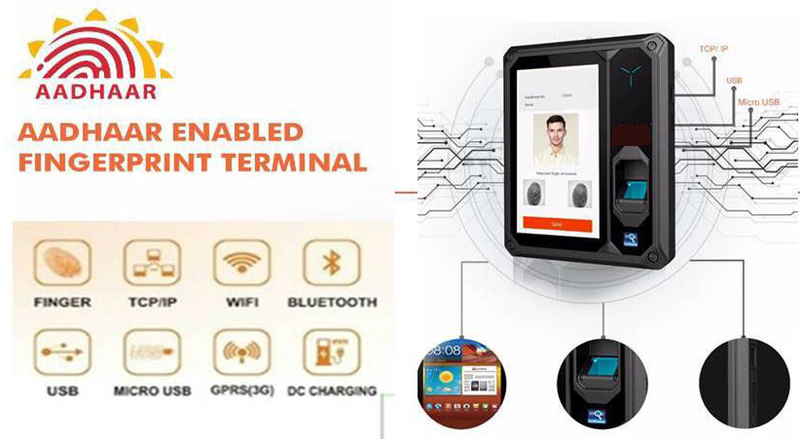 Modern biometric systems comprise of hardware and software that are pretty simple to install and set up. This reduces the need for intense training and thus management is also quite simple and easy. The documentation is not very intense leading to saving time and as a result costs. Plus it saves you on many costs like issue of new cards, replace lost/damaged card etc. Creating a Biometric Access System creates a clear trail of movement and accountability with lower chances of misuse. Give a friend your access card to swipe you in? – Easy. Ask him to put your thumbprint or retinal scan on a Biometric Reader? – Impossible. Apart any event can be easily traced back to the persons involved. With the enhanced security, better accountability and lower opportunities for fraud that a Biometric System provides the ROI on investment is much higher than traditional systems. Modern systems can help you seamlessly integrate and manage time attendance, access control, surveillance and visitor management through a single window with instant alerts and actionable information delivered through multiple devices. They provide centralized control in the hands of the security administrator. With a Biometric Identification System, this becomes even more effective. If security of your physical and intellectual assets is on top of your mind, you cannot ignore an Aadhaar based Biometric Identification Systems that are really effective, versatile and cost effective. Combine this with an advanced integrated security platform that will improve control, reduce management costs and provide a better user experience. Central Government employees meanwhile have expressed their objection to linking the daily attendance timecard with Aadhaar. Mr. Duraipandi, the General Secretary of the Employees’ Sammelan, said, “We have no objection to implementing a biometric attendance system. But, linking the Aadhaar card information with the attendance record is unnecessary and in violation of personal rights. Adding my personal information to my office attendance violates my right to privacy. The Ministry of Home Affairs (MHA) going to announce in the 15th Finance Commission about its budgetary requirement of more than Rs 3.5 lakh crore for internal security and other responsibilities between 2020-25. The budgetary requirement is meant for internal security, Central Armed Police Forces, police modernisation, border security, disaster management and Union Territories.